Written by JONATHAN LANDRUM Jr.
Kirk Franklin, Marvin Sapp, Donnie McClurkin and Israel Houghton believe if they collectively raise their voices high enough, believers will come in droves. And Live Nation is banking on it. The four gospel superstars feel confident entering the upcoming King’s Men tour, the first gospel concert tour backed by Live Nation Inc., the world’s largest concert promoter. The concert series will be the first step toward proving the genre can broaden its fan base and become a lucrative business for the promotional company. The 16-city tour kicks off Sept. 16 in Phoenix. 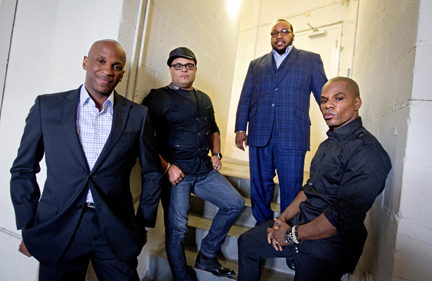 Franklin views it as an opportunity to pave the way for other top gospel acts. As a follow-up to King's Men, he hopes there will be an all-women gospel tour that'll include acts such as Mary Mary and Yolanda Adams. Franklin assembled the team of gospel's heavyweight singers to join him, and then approached Live Nation with the idea of the King’s Men tour. He invited one of the company's executives to attend the recent Stellar Awards with him. That’s all Franklin needed to hook Live Nation, and everything else fell into place. Morrow said he was impressed by the different elements of musical talent the self-proclaimed “King’s Men” bring to the table. He was attracted by McClurkin’s smooth crooning, Frank­lin’s ability to mesh a hip-hop melody with gospel as a producer and choir director, Sapp’s soaring voice and Houghton’s jazzy rock presence. Morrow said the tour could lead to additional cities for the King’s Men. He said Live Nation also is looking into promoting gospel tours through House of Blues venues for up-and-coming artists in the genre. But it’s predicated on how well the King's Men tour packs venues in each city. Live Nation isn’t concerned how the tour will do in larger cities like Los Angeles and Houston, but will certainly keep a close eye on smaller markets like Tampa, Fla.; Hartford, Conn.; and Norfolk, Va. The cities for the tour were chosen based on the foursome’s strongest markets and their hometowns. Sapp knows there are no guarantees. However, he feels optimistic that people from the gospel community will come out and support the tour.